It was a comprehensive win in the end and one that encapsulated what Arsenal can do under Unai Emery. The Gunners secured the three points against an Everton side who have invested heavily in their playing squad over the past few seasons. Richarlison, Gylfi Sigurdsson, Kurt Zouma and Jordan Pickford make up the spine of a team managed by Marco Silva – and ambitions of a top six finish should certainly not be scoffed at. However, this 2-0 victory was all about Arsenal’s two frontmen who cost the club almost £100 million; Alexandre Lacazette and Pierre Emerick Aubameyang. The duo now have six goals in four games between them and continue to look like a duo worthy of leading Emery’s side to a top four finish this season. It might be early on in the campaign, but having Aubameyang – a player with blistering pace who can stretch defences, as well as score goals by the bucket load - gives Arsenal a new dimension. Lacazette’s ability to pressure opposition defenders and create space with his intelligent runs means that the north Londoners have an attacking duo most teams will be very jealous of. Emery’s side have now recorded five wins on the bounce and they also kept their first clean sheet of the season against the Toffees. Petr Cech produced an impressive goalkeeping performance amid murmurs that £20m summer signing Bernd Leno could replace him as No.1 soon. The Czech shot stopper denied Richarlison with a finger-tip save in the first half while he also made a couple of more unorthodox stops with his feet to keep the score at 0-0. 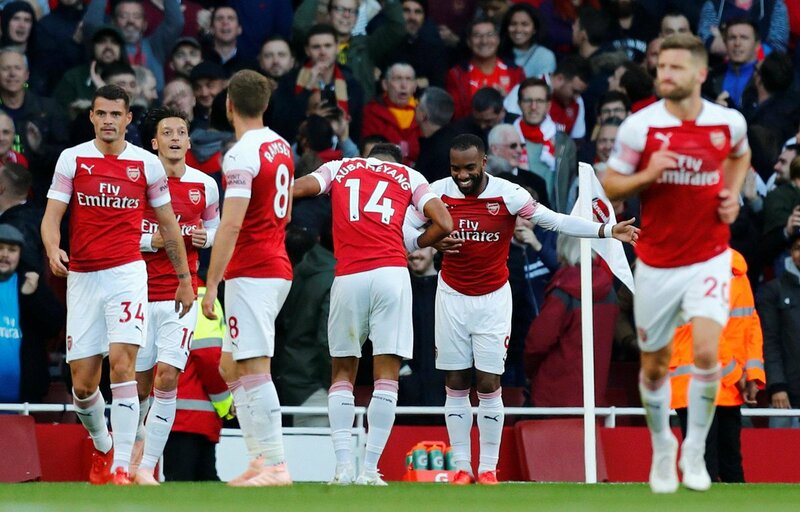 It was Lacazette who opened the scoring with a delicious curling strike after Aaron Ramsey directed the ball towards him – an effort that Gunners legend Thierry Henry would have been proud of. The Frenchman looked like he was falling asleep on the bench during Arsenal’s 4-2 win over FC Vorskla in the Europa League on Thursday, but he was full of energy in the final third on Sunday as he guided Arsenal to a deserved win. Aubameyang’s goal provided an example of what Arsenal can do when they are at their free-flowing best and their opponents show lapses in concentration. Just two minutes after the opener it was Mesut Ozil who drove into the box to find Aaron Ramsey, whose deft touch found the Gabon striker for a relatively easy finish from close range. It wasn’t a perfect day at the office as defender Sokratis was forced off with a knee injury in the first half, a knock which the Gunners will hope is not too serious. Emery’s men now sit in sixth position, level on points with rivals Tottenham. And they will be confident of winning their next few league games against the likes of Watford, Fulham, Leicester and Crystal Palace – especially with Aubameyang and Lacazette playing so well together.